The complex challenges associated with fossil energy research require collaborative, cross-disciplinary approaches and quick, efficient access to resources. However, collaboration between multiple organizations, from academia to industry, can be difficult. Multi-organizational teams working jointly on research projects often encounter problems with data sharing due to large file sizes, inappropriate file formats, or other inefficient options that make collaboration difficult. 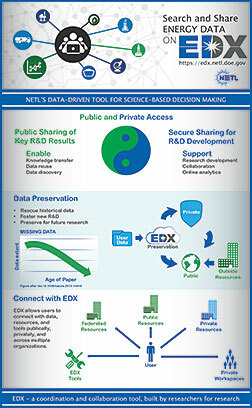 The Energy Data eXchange (EDX) from DOE's National Energy Technology Laboratory helps to overcome these challenges by serving as an online system to facilitate internal access to research that crosscuts multiple NETL projects/programs and external access to technical products and data published by NETL research teams. EDX represents an innovative approach that was explicitly designed to improve knowledge transfer, coordination, and collaboration for more efficient research specifically targeting fossil energy concerns. The system aims to improve R&D efficiency and reduce redundancy through better access to primary data sources relevant to ongoing and future research projects. According to Kelly Rose, the EDX coordinator, “EDX is a tool built by researchers, for researchers, and represents a novel and innovative combination of capabilities that respond to the unique needs and challenges faced by ongoing research, as well as the need to preserve future research-scale datasets and products.” From the project’s onset, the EDX team has sought to blend functionality from social media type systems with more conventional R&D online needs, to offer innovative content driven by the research community within the EDX system itself. Other EDX resources, including EDX Groups, EDX Portfolios, and EDX Tools, help organize information under different topical themes to assist EDX users with finding pertinent information. With EDX Groups, users can organize datasets by theme, for example Appalachian Basin Data Group. EDX Portfolios offer an overview of key NETL research and development programs, such as Unconventional Resources. EDX Portfolios also highlight data-driven products resulting from these efforts. Users can add data to EDX via the EDX Contribute function, and users can also discover these data via EDX Portfolios, Tools, Groups, and other areas within EDX. Data are put to use in EDX Tools—a suite of applications driven by data resulting from NETL projects. In addition, EDX’s search functionality streamlines the hunt for outside data and resources. Scientists across NETL rely on EDX to collaborate with partners at universities, industries, and other National Labs and government agencies. Researchers in the Offshore Energy Resources team use EDX as they develop a scientific base for reducing and quantifying potential risks associated with exploration and production in offshore environments. Another example is engineers from the National Risk Assessment Partnership—a multi-agency initiative among five National Labs—which is harnessing the breadth of capabilities across DOE into a mission-focused platform to develop a defensible, science-based quantitative methodology for determining risk profiles at CO2 storage sites. There are approximately 500 users in the EDX community, comprised of both internal users (50%) and external collaborators (50%). The number of EDX users continues to expand and has grown considerably since its introduction. EDX currently has approximately 7,000 energy-related data resources, as well as access to over 200,000 data resources through the federated search functionality. Recently, EDX launched an advanced, cross-organizational search functionality enabling users to access numerous energy data resources from agencies such as National Oceanic and Atmospheric Administration, National Aeronautics and Space Administration, and the United States Geological Survey, without leaving EDX. In addition, newly released public features are promoting information and technology exchange through access to NETL data-driven products in EDX’s groups, portfolios, and tools. Many NETL project teams have begun development of EDX portfolios and Collaborative Workspaces as working tools to collaborate and to advance the visibility of work accomplished at NETL. Data access, utilization, and preservation have emerged as a key concern for all scientific-based research and analysis worldwide. EDX represents a unique combination of capabilities that respond to the specific needs and challenges faced by ongoing research, as well as the need to preserve future research-scale datasets and products. Ultimately, EDX seeks to ensure improved access to data and resources from a range of sources, offering a venue for the “publication” and dissemination of new datasets as well as historical, often inaccessible, assets. This data-driven tool ensures the preservation and availability of these assets for use in future, yet-to-be envisioned purposes.